My Iron Lung EP set for UK re-release. 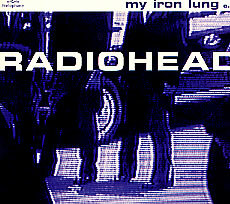 Parlophone is set to reissue Radiohead’s classic single/EP for My Iron Lung on January 31. It’ll set you back &pound 9.99, $18.39, or &euro 13.99, and is available from Eil.com. Although the rerelease isn’t until the 31st, Eil.com still has copies from the last release that are selling at the same price and available now. Previous post: $48,000+ in tsunami aid. Next post: Tsunami fundraiser ends, with over $64,000 in donations.